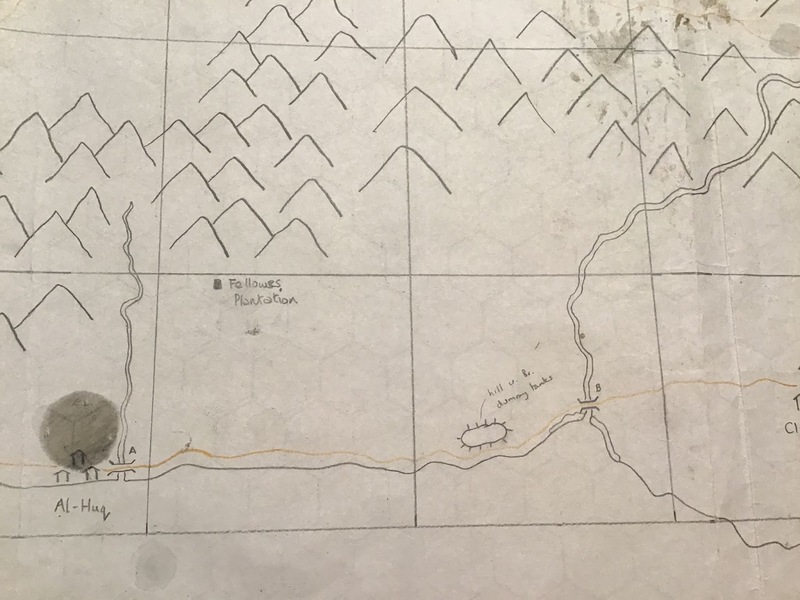 It looks like there's a good chance I'll go ahead with revisiting the Woebetide Islands as the setting for an early eighteenth century skirmish campaign. 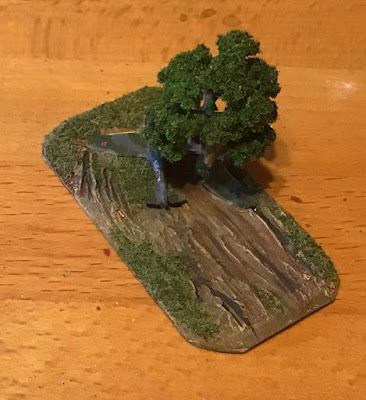 The owners of Wargames Illustrated seem to be keen that I do this as they've been mounting sprues of Woebetideus natives on the front cover of the magazine. I say Woebetideus natives; WI (and manufacturers Warlord Games) regard them as Zulus or Natal Native Contingent but we know better of course. I've got three of the four finished so far along with a dead Woebetideus left over from a pack I used in putting together a Gloranthan Hordes of the Things army many years ago. I don't particularly want these guys to look like transplanted Zulus so I'm going for the Natal Native Contingent look wherever possible. For preference I'm using the NNC heads and the smaller shields. 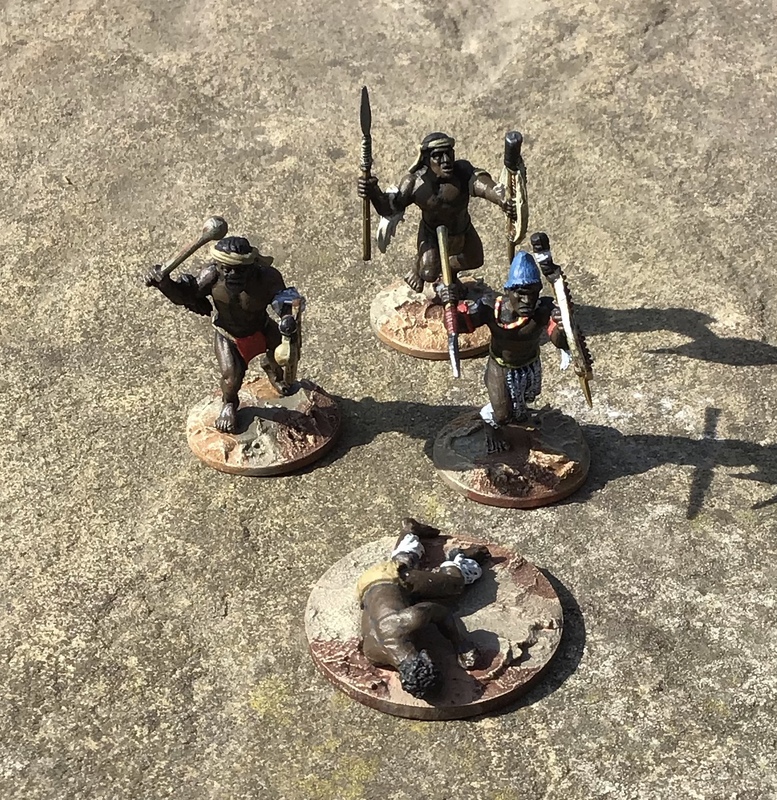 Wargaming mate Chris has donated a second sprue so in a week or two I hope to have eight Woebetideus tribesmen. That's enough for a first unit for either Sharp Practice or Muskets and Tomahawks. I knew it! 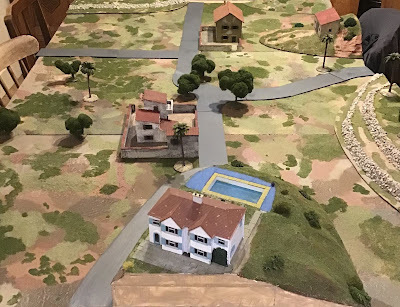 As soon as I committed publicly to spending time building 6mm terrain, I'd get enthused by another project in 28mm or 20mm. 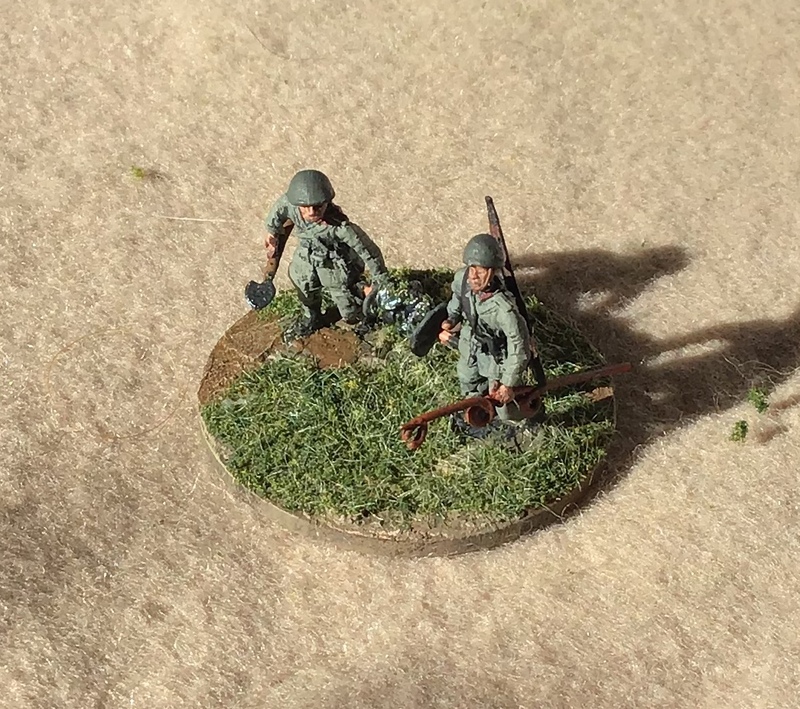 However, I have managed to get some 6mm stuff done. First up is my Roman camp. 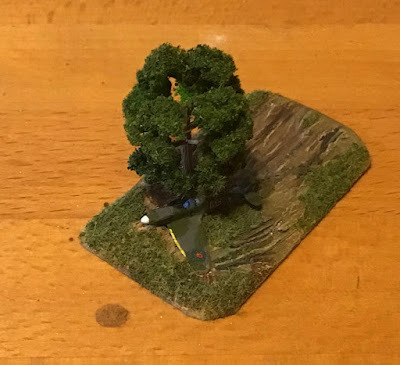 The resin tents are by Leven Miniatures. I've left most of it as bare earth on the grounds that there would have been a lot of soldiers walking around. Maybe I've overdone it? A bit more grass? 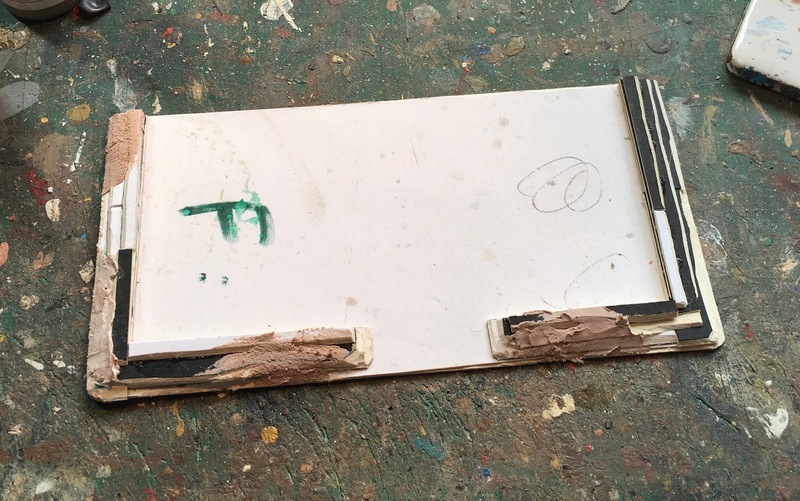 I had a rather nice Spitfire model that I acquired many years ago but that got a wing broken off in a tragic being-dropped-in-front-of-an-opening-door accident. 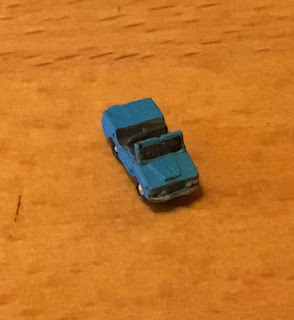 Sorry the pics are a bit dark but at least it disguises my poor paint job. 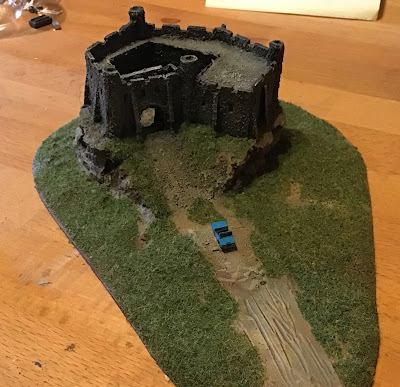 And finally for now we have the castle that appeared in my previous post on this subject. As I said previously, I reckon this will sit happily in the corner of any 6mm game from the Middle Ages onwards (without the car of course). 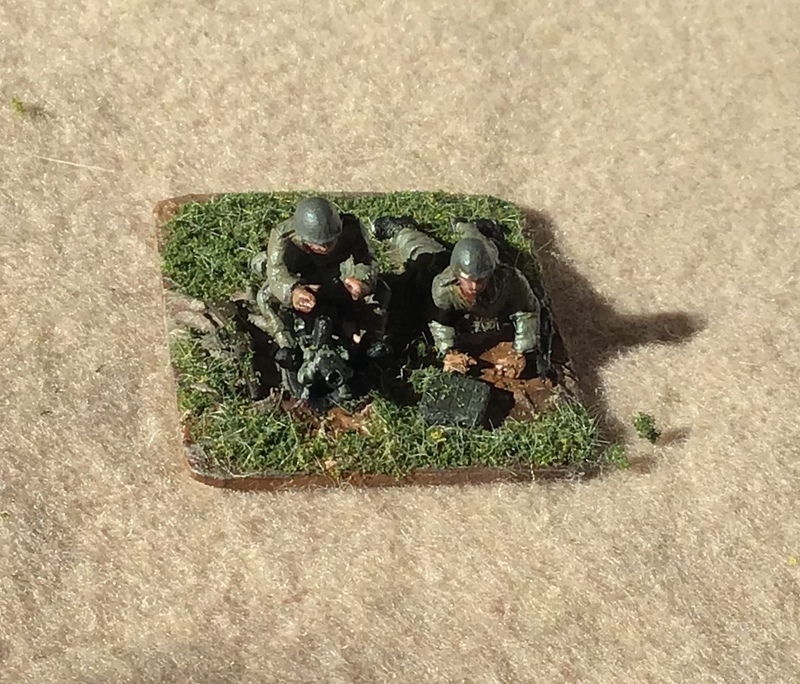 OK, so I've got some 6mm stuff done. I promise to comeback with some more. Eventually. Muskets and Mangoes - A Future Project? 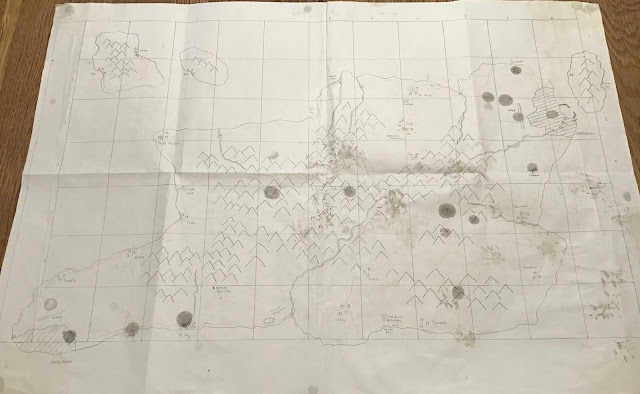 This, with its Blutac stains, rips, and muddy cat paw prints, is the original master map of the Woebetide Islands, location of some of the world's finest mango plantations. The Woebetides were the setting for a play-by-email campaign I ran over several months in 2000. 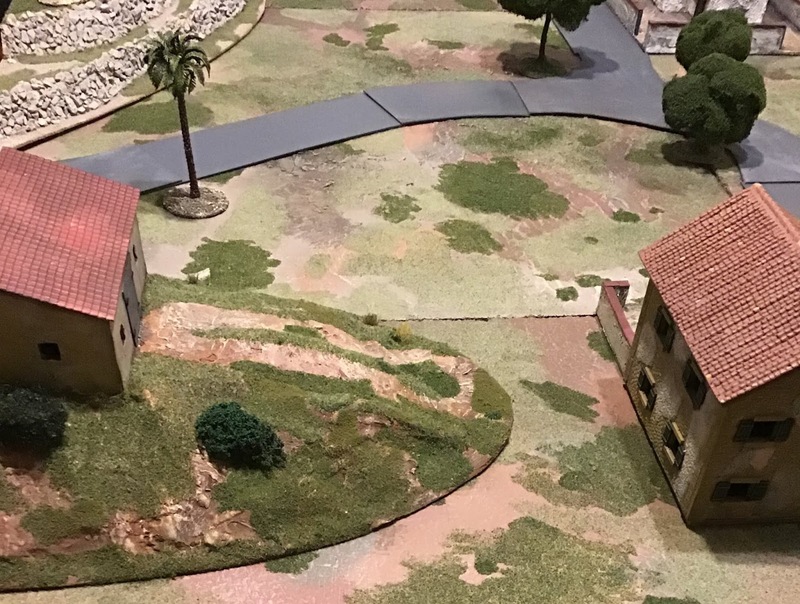 The campaign covered the less-than-peaceful coexistence of British and Vichy French colonies in these little-known (OK, fictional) Indian Ocean islands in 1942. 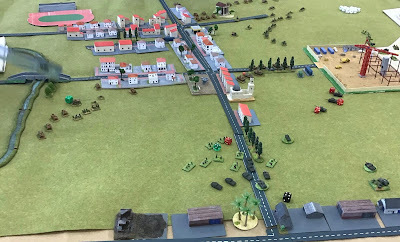 In the end the British launched a victorious operation that installed a pro-deGaulle administration in Charleville. I recently rediscovered some of the campaign notes and was reminded what great fun it all was. Meanwhile, I've been hankering to do some Sharp Practice at the earlier end of its timescale - the first half of the 18th century. 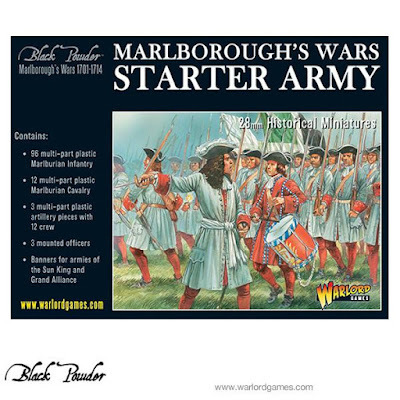 The availability of the Warlord Games War of the Spanish Succession figures in plastic is tempting me. But then again I keep looking at Indian Mutiny games and thinking, "That would be fun - so many great plot ideas!" Now, I could do 18th century British vs French in India but I don't know much about the history other than that it all seems to really kick off a bit later; during the Seven Years' War. Then this morning the thought came to me. 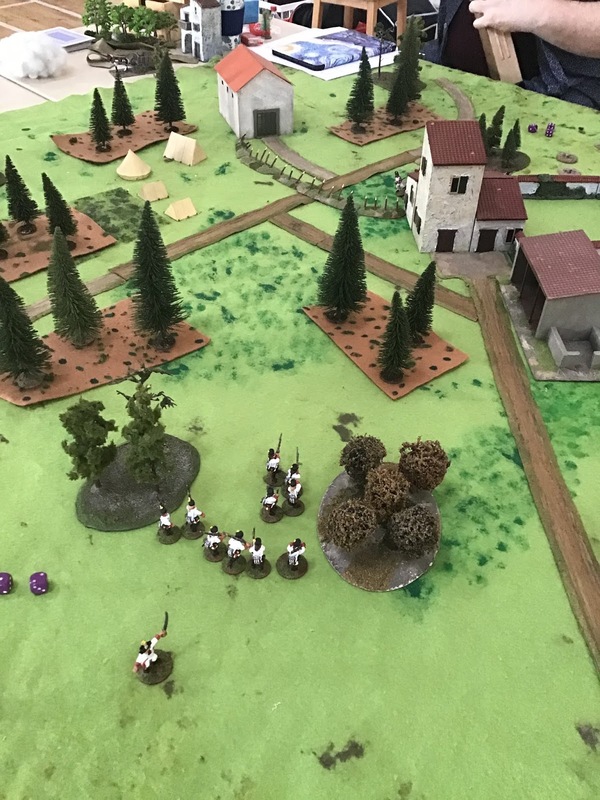 Why not game the first British and French involvement in the Woebetides? There are plenty of opportunities to involve the Arab traders in their coastal settlements, the African-descended natives in the hills, and probably pirates too! The final stage in my evolving thought process is that maybe this could be a project for a future Crisis Point? 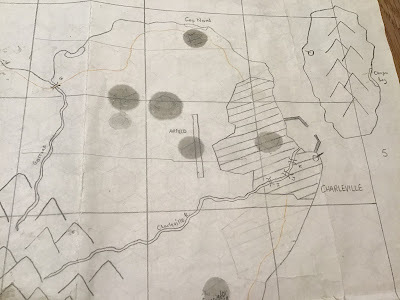 I rather fancy the idea of having multiple factions, each with multiple objectives, running around a big table that represents the whole of the main island. It's about a day's forced march from end to end. I've decided to spend a little while working on some 6mm terrain. 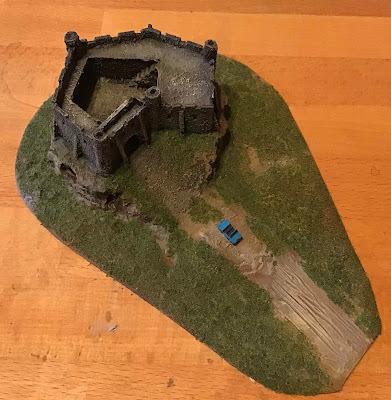 Nothing major, just making best use of some bits I've got lying around and trying to give my battlefields a lived-in look. 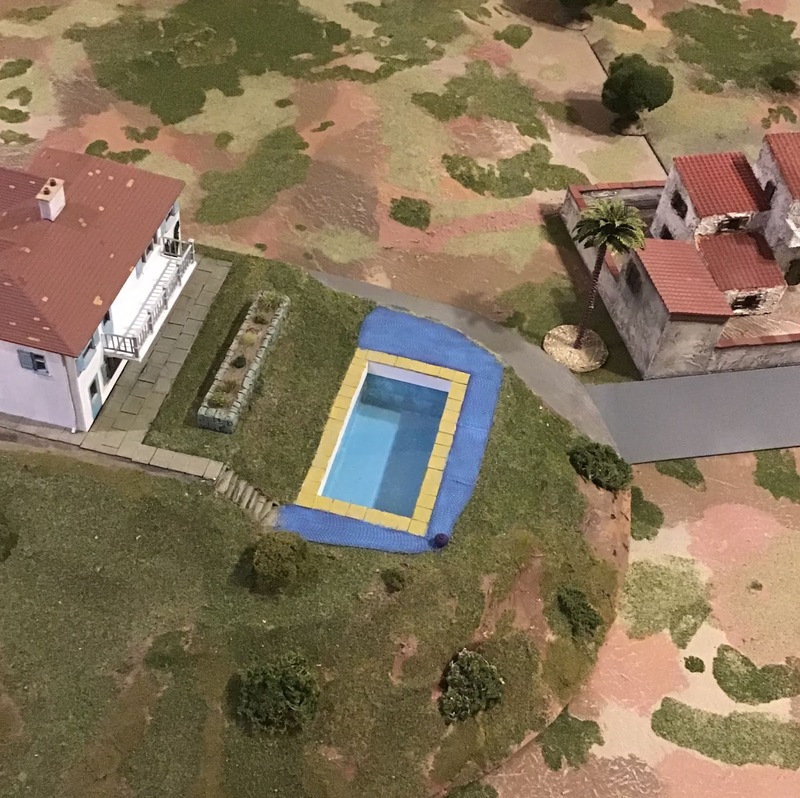 First up, I'm going to make a generic banked camp for my 6mm Late Roman forces. It's very simple; just a piece of artist's mounting board cut to 150x75mm. That's the size of two squares on my smaller To The Strongest! board. I've started glooping it with my usual coloured tile grout. 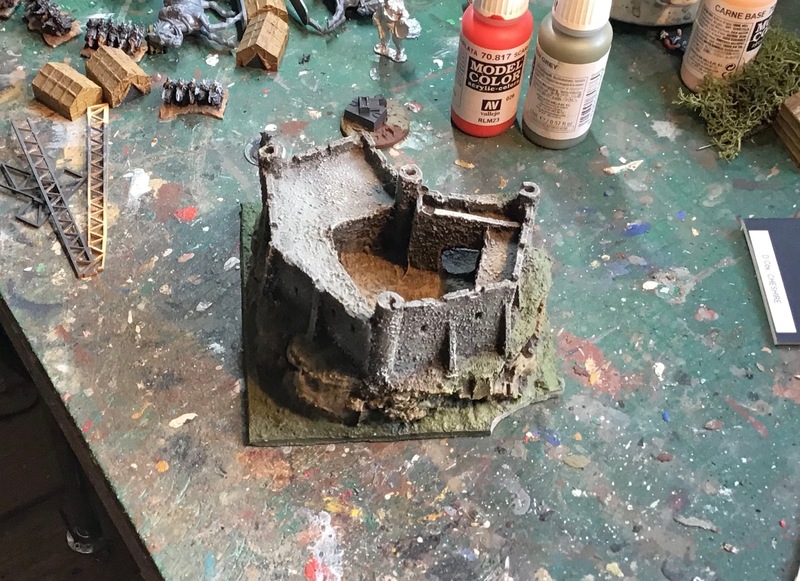 I've also dug out this resin castle. I bought it years ago and it saw use once or twice as a Hordes of the Things stronghold. It's slightly smaller than 6mm scale and one corner of the cast-on resin base has broken off. What I think I'll do is mount it on a piece of PVC board shaped to give me a natural-looking hill. 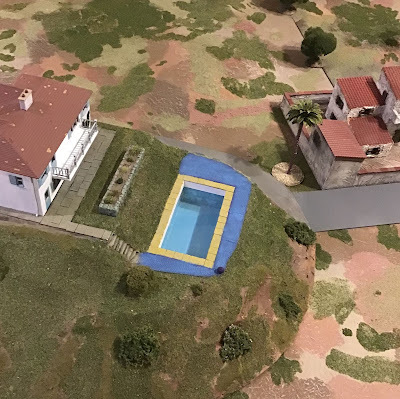 It'll make a nice piece of set dressing for 6mm scale battles in any period from the Middle Ages onwards. I think I might break off the other square corners as they tend to catch the eye even when buried in gloop. Apart from that it's just a case of scrabbling around in the bits box to see what else I may have that can be turned into passable 6mm scale stuff. Labels: 6mm, Ancients, To The Strongest! As usual after Crisis Point, the last thing I want to do is sit down and blog about it at length. But here's a brief over view of the games. 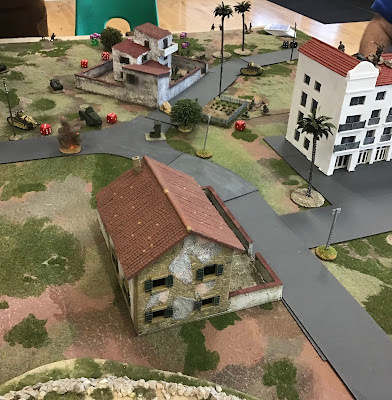 The weekend went very well; I'm really pleased with the number of people who came and the spirit in which the games were played. Table two was occupied by Jamie's game of Song of Drums and Shakos. This was set in 1794 and saw two groups of revolutionary French up against a combined Austrian and Sardinian-Piedmontese force. From what I could see, this seemed to go very well, with four players engrossed right up the the close of play. 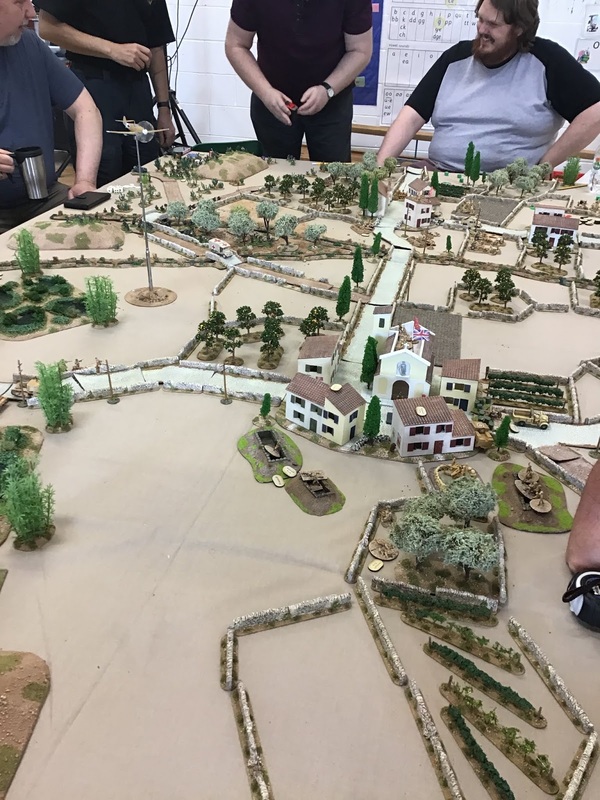 Finally on day one we had big table depicting part of Malta in 1942. This used Will McNally's excellent terrain on which a fictional German invasion was played out using the Battlegroup rules. On Sunday, I switched to running a game of To The Strongest! set during the Second Punic War. Jamie was keen to play in this game and as there were three other games to hoover up players, Jamie and I ended up playing this game with just the two of us. Surprisingly, for such a fast-play set of rules we didn't quite reach a conclusion. I think my Carthaginian left was going to collapse before my right wing captured Jamie's Roman camp. The next game on Sunday was Kevin Tingle's Beirut Force on Force game. Kevin's game was a masterpiece of low-cost city building, using cardboard and balsa wood instead of expensive resin castings. I didn't get to see much of this game in action but the idea of Soviet airborne troops landing at a half-constructed airport was a fun one. 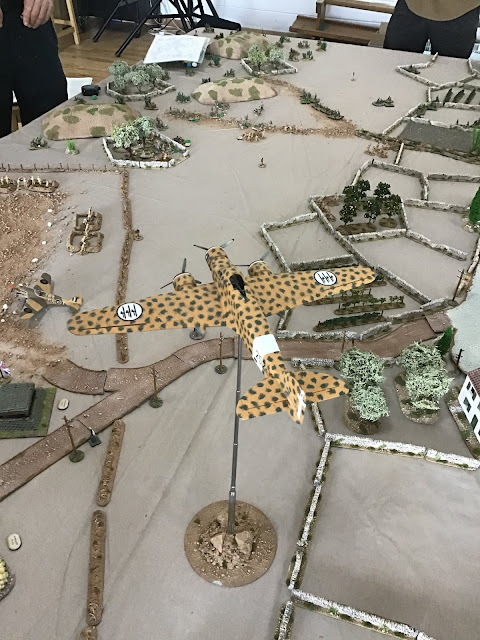 Finally on Sunday, the Malta game continued, this time moving on from the initial airborne attack to a German seaborne invasion. I'm very pleased with how Crisis Point went. 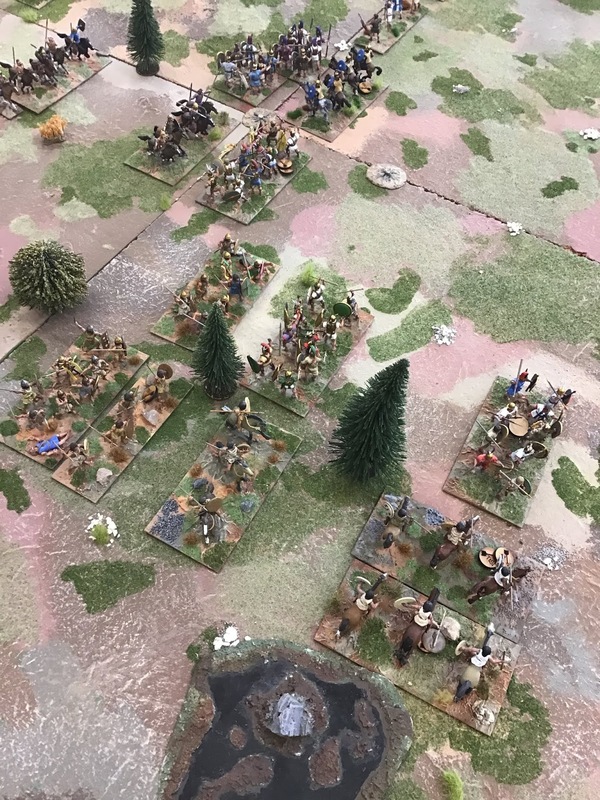 it was a pleasure to welcome attendees both old and new and in particular to see how the younger gamers (four this year) coped well with a whole weekend of intense table-top action. I did a terrain check last night to see what the terrain I've built for the Menton game would look like en masse. I'm reasonably pleased with how it went. The hill-with-a-barn-on-top in the picture above is a new addition in the last couple of weeks as are the two walled yards around the roadside buildings. The terraced hills are reused from the SOTCW Salerno game at Gauntlet back in 2009. That was before I started this blog so they may not have appeared here before. The largest of them is slightly warped so I may replace it with a couple of smaller ones. I'm trying to capture the idea of leafy suburbs of mention. Richard Phillips is bringing a couple of hotel-sized buildings that would add nicely to the scene. 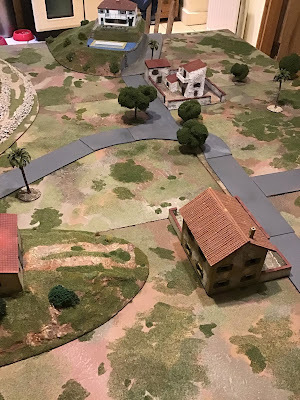 It's a while since I blogged here but i've been working hard on getting stuff ready for my Menton 1940 game at Crisis Point. Terrain is the main focus of my efforts, and I'll cover that elsewhere, but I've also done some preparation of forces. I created these in Pages on my Mac. I'll probably laminate them before the game. 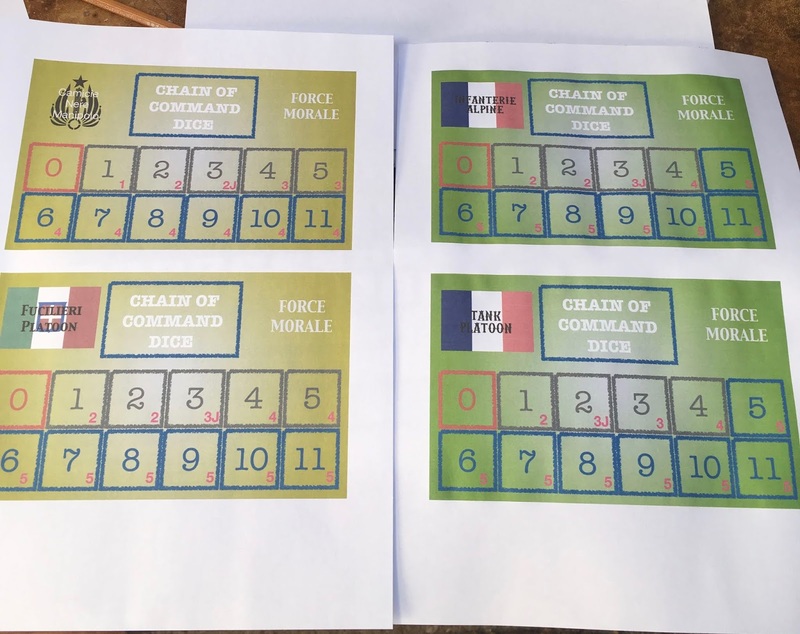 I've increased the size of the box for your Chain of Command Dice as it's not unusual to have two or more on the go. 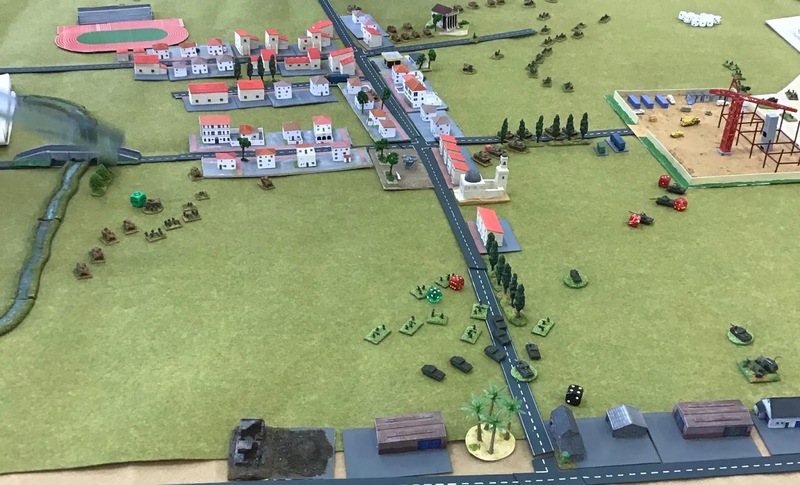 The FM tracking boxes are colour coded to flag up when the first negative impact occurs and the red numbers in the bottom right hand corner of each square show the number of command dice rolled and, in some cases, when a unit must withdraw to its nearest Jump Off Point. I've completed my French platoon by adding three VB rifle grenadiers from Early War Miniatures. The Caporal is an old FAA model with a rifle from the spares box modified with a Green Stuff VB launcher cup. 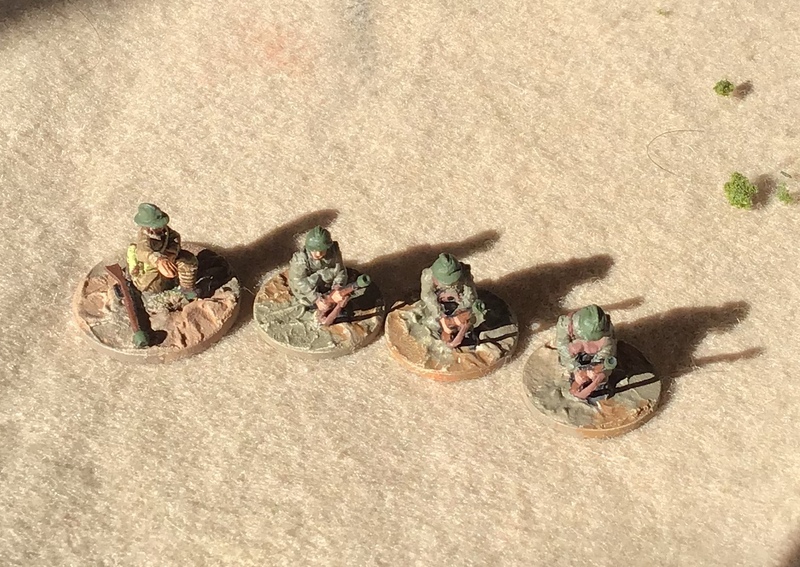 For the Italians I've now completed my Blackshirt platoon (or Camicie Nere Manipolo to be accurate). 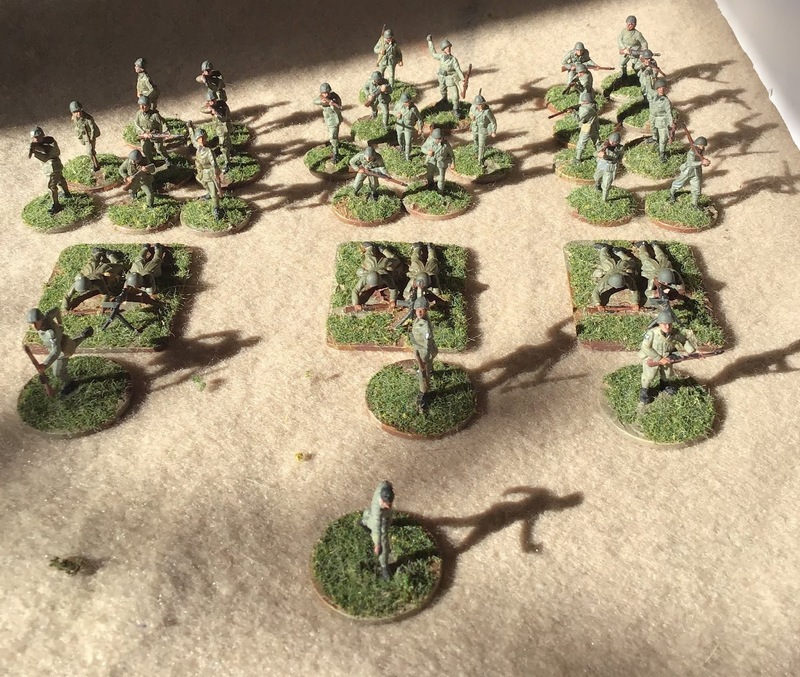 They are a mix of Italeri Italian Mountain Troops with the feathers removed from their helmets, Airfix Italians and a few Airfix Japanese for variety. 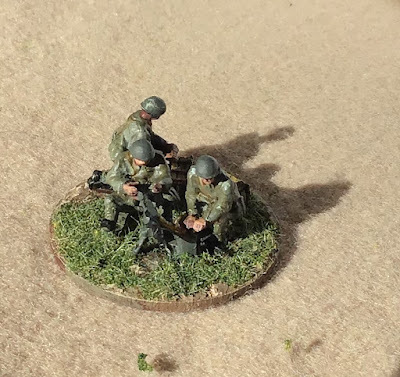 The LMG teams should have three men but I plan to use a system of unobtrusive markers to indicate when a team differs in strength from the number of figures on the base. The same will apply to this MMG team. All the figures are from Early War miniatures. Also from EWM is this engineer team. I couldn't resist them when I saw them event though they were in Western Desert uniforms. I replaced the original heads (which had sun helmets) with steel-helmeted ones. One came from a SMG-gunner that EWM kindly added to my order and the other is from the Italeri plastics. I also had to sculpt long breeches to replace the shorts worn by the castings. 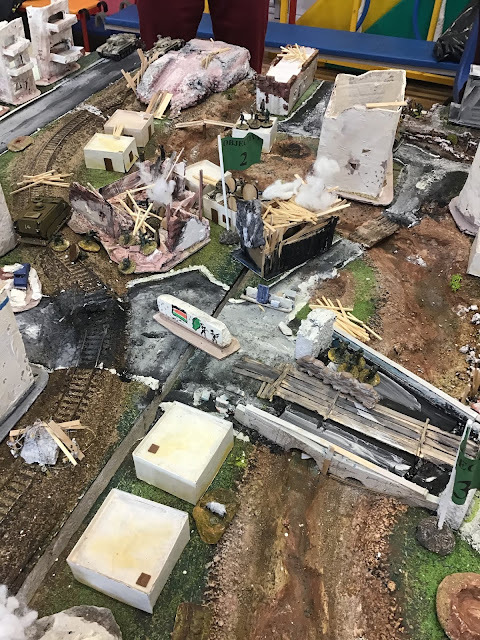 The casting was a bit imprecise around the figures' hands and it was impossible to get a strong bond to the pole on which the barbed wire reel is slung. Also the pole snapped on one side while I was cleaning it up. I ended up replacing it with brass rod and drilling holes in the figures' thighs into which the rod could firmly sit. I then sculpted new hands in place. The Brixia 45mm mortar team is pretty much as it came, I think. There were a couple of steel-helmeted heads as options. I may have had to do another shorts-to-breeches conversion; can't recall exactly. 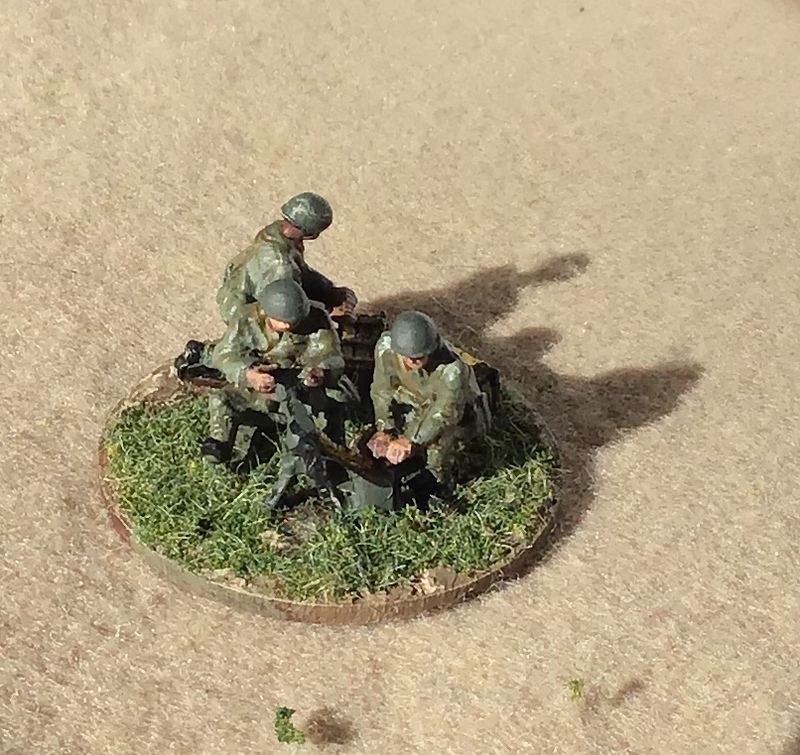 He started out as an Italeri mountain infantry officer with a pistol. A head transplant from another Italeri figure gave him a steel helmet. I cut way his pistol and threaded some thin wire through his hand. The wire was from one of those paper ties for a food bag. I then sculpted the telephone handset and the satchel containing the phone from Green Stuff. The wire goes into the satchel and then comes out. 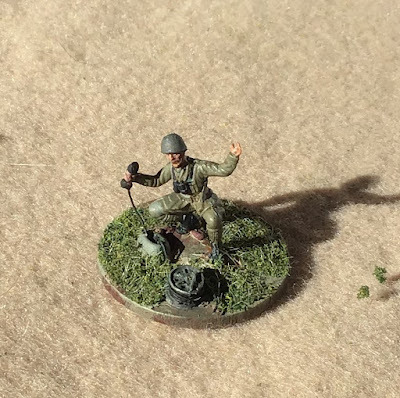 It winds round a small cable drum that came with the engineer team, and then runs to the edge of his base. There's a 47mm infantry gun and a platoon of CV3/33 tankettes to photograph too. I'll get them posted shortly.